Kimberley - Fitzroy River in flood near Fitzroy Crossing. The Fitzroy continues around to the left with one arm of the Margaret River turning to the right and then into the background. 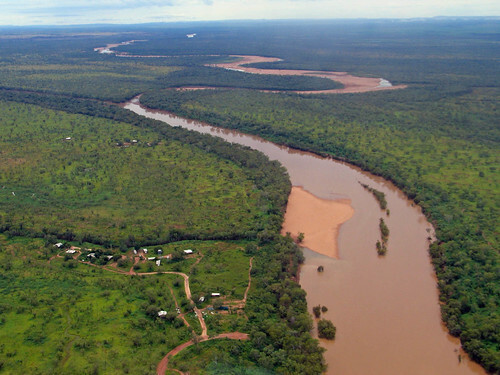 Photo taken during the wet season with the Fitzroy in flood (and the Great Northern Highway possibly cut off Halls Creek side of Fitzroy Crossing. The old Crossing is underwater (in the foreground).